Sciatica is a term describing the lower back pain that radiates to the area of the buttock, hip and down one leg to the foot. Being the longest nerve in the body, the sciatic nerve runs down along the back of the pelvis, all the way down both legs ending at the feet. The pain is usually caused where the nerve passes through the bones at the lower spectrum, of the spine (lumbar vertebrae). Symptoms of sciatica affect only one side of the body although it may, however, affect both sides in certain cases. Weakness or numbness may occur in differing parts of the affected leg and foot. It may be sudden in onset and can persist for days or weeks. It can be caused by a few different conditions that lead to the compression or irritation of nerves as they exit the spinal canal (space which the spinal cords travels) in the lower back area where it comes together to form the sciatic nerves at the end of the spinal column. In comparison to patients who suffer from low back pain alone, patients who complain of back and leg pain take longer to recover. 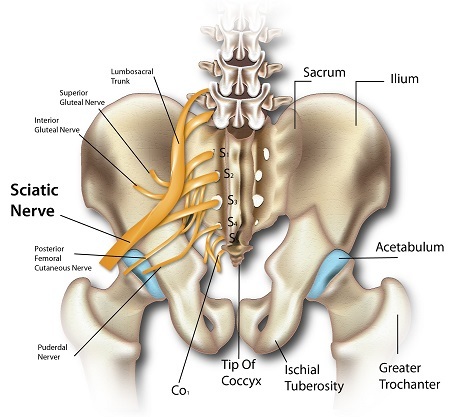 Sciatica is a relatively common condition that has a lifetime incidence varying from 13% to 40% with the corresponding annual incidence of an episode of sciatica from 1% to 5%. The incidence of sciatica is related to age as it is rarely seen before the age of 20 and peaks in the fifth decade and declines after. Regular walking was also shown to almost double the incidence of sciatica while jogging decreased the incidence of sciatica in those who were pain-free but increased in those with a previous history of sciatica. An increased amount of physical activity has also been shown to increase the incidence of sciatica (carpenters more likely compared to office workers, farmers more likely than retired farmers). Driving is also associated with sciatica and may be due to vibration around 4-5 Hz. Smoking has also been associated with sciatica. 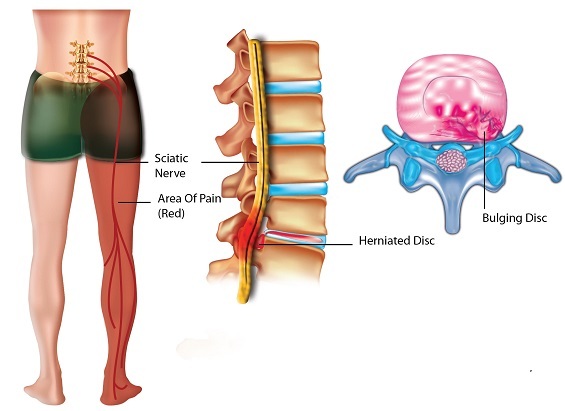 The most common cause of sciatica is when the gel-like center of the disc between the vertebrae (bones that make up the spine) protrudes into or through the disc. This is called a herniated disc and results in a compression of individual nerves in the lower back. A diagnosis can be made with a complete patient history and examination of the patient. This is usually a clinical diagnosis (diagnosis made by patient history and examination) but x-rays can occasionally aid in diagnosis to show evidence of spondylolisthesis (misalignment of the vertebrae), narrowed disc space, or evidence of erosion that may suggest a tumor that is affecting the spine. Other possible imaging would be magnetic resonance imaging (MRI) that allows the visualization of vertebral discs, ligaments, muscles and possible tumors. Computed tomography (CT) using contrast dye injected into the spine also allows visualization of the spinal cord and nerves. Some have said that imaging is only indicated in patients in whom disc surgery is considered. Other approaches may include spinal cord stimulation, acupuncture, psychotherapy and cognitive behavioral therapy. Most patients with sciatica have a favorable prognosis but about 20% – 30% have persistent problems after one or two years. The general consensus is that initial treatment is conservative for about 6-8 weeks. Passive (bed rest) treatments have been replaced with more active treatments. Disc surgery may provide a quicker relief of pain than conservative care but no clear differences have been found after one or two years. It may only be recommended if analgesics and physical therapy have not resulted in symptom relief, if symptoms have progressed or if bladder or bowel incontinence occurs. Sciatica is a common condition that causes a lot of work absenteeism and a major financial burden to the health service provision. Fortunately, most cases of sciatica are self-limiting and pain usually resolves within a few months. Studies have not identified one main cause of sciatica but have identified several causes that may have contributed to it. More studies to find the main causative factor may permit the targeting of treatments to different patient subgroups. Ropper AH, Zafonte RD. Sciatica. New England Journal of Medicine. 2015; 372(13):1240. Hildreth CJ, Lynm C, Glass RM. Sciatica. Journal of American Medical Association. 2009; 302(2):216. Selim AJ, Ren XS, Fincke G, Deyo RA, Rogers W, Miller D, et al: The importance of radiating leg pain in assessing health outcomes among patients with low back pain. Results from the Veterans Health Study. Spine. 1998; 23:470-474. Stafford MA, Peng P, Hill DA> Sciatica: a review of history, epidemiology, pathogenesis and the role of epidural steroid injection in management. British Journal of Anaesthesia. 2007; 99(4):461-473. Frymoyer J. Lumbar disc disease: epidemiology. Instructional Course Lectures. 1992; 41: 217–223. Miranda H, Viikari-Juntura E, Martikainen R, Takala EP, Riihimaki H. Individual factors, occupational loading and physical exercise as predictors of sciatica pain. Spine. 2002; 27:1002–1009.